We are amongst the highly reliable manufacturer, supplier and service provider of excellent array of Designer Hand Painted Sarees. Perfect for any occasions and celebration garments, these designer hand painted sarees are very durable and stylish available at reasonable prices. Steadfast to our commitment of providing best quality array of products, we manufacture, supply and provide service finest quality array of Designer Hand Painted Sarees. These Designer Hand Painted Sarees are very elegant and lovely looking garments that are ideal for attending wedding, anniversaries, birthdays and many other occasions. 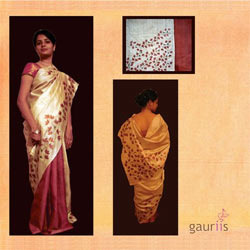 Our Designer Hand Painted Sarees showcase the beautiful and intricate traditional Indian designer wear. These are very soft and smooth made from premium grade fabric materials. It will be worn by the adults.